For 75 years, trains carrying orphans brought about 200,000 children from New York to the rest of the country, many of them to the Midwest. As many as 100,000 of those children came to Missouri. 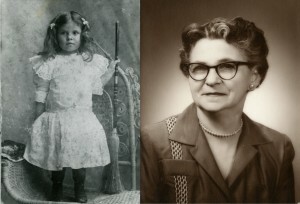 One of them was Irma Craig, mother of Shirley Andrews of Jefferson City. Andrews has been researching her mother’s story. Craig was dropped off at under two months old at New York Foundling Hospital in New York City. She was cared for by the Sisters of Charity of St. Vincent de Paul and in 1901 at the age of three, arrived on a train in Osage City, Mo. She was taken in by George and Katherine Boehm. Andrews says her mother was well cared for by the Boehms and doted on by George, but when Katherine died of pneumonia, Craig was taken in by neighbors John Rackers and his widowed sister, Adelaid. Andrews says Craig was even happier in that home. Such work was what the creator of the orphan train program had envisioned, according to Missouri State Museum Curator Muriel Anderson, who spent three years with the National Orphan Train Complex in Concordia, Kansas. 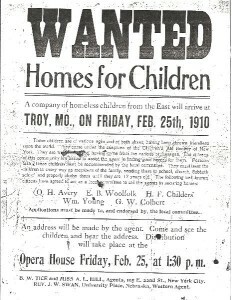 Andrews says in little towns all across the Midwest, like Osage City, orphan trains provided a significant percentage of the population of children. Irma Craig tought at a one-room country school from about 1917 to 1921 before marrying Robert Schnieders. Andrews says her mother left behind a great legacy. 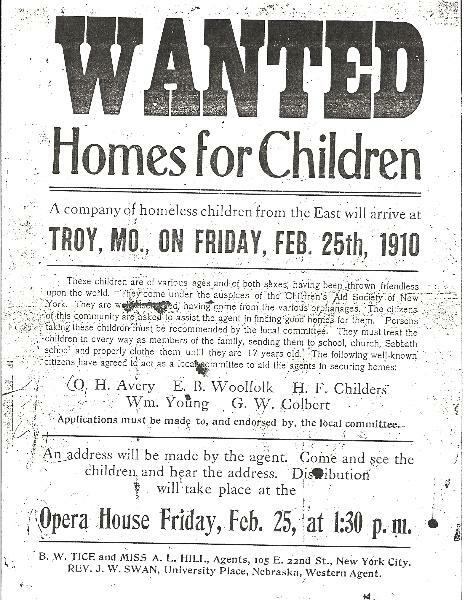 The orphan trains quit running in 1929. Today, it is estimated that one in 25 Americans has a connection to an orphan train rider. For those looking for more information on the Orphan Trains, contact the National Orphan Train Complex.